On June 19, we spotted Selma Blair and her little guy shopping at The Grove in Los Angeles. And the denim-clad duo looked adorable, especially Arthur who sported a straw fedora, green graphic tee and faded jeans. But the almost 2-year-old’s fun Chooze Scout slip-ons (now $39, originally $49) are what really caught our eye. Upon close inspection, we noticed each shoe has a different pattern (guitars on one and skulls on the other). Apparently, Chooze kicks all come in mismatched yet complementary prints for kids who like to mix things up. Want to see more of their cool footwear? Go to choozeshoes.com. While we were still drooling over the brand’s gorgeous new Cosmic collection (Aries! 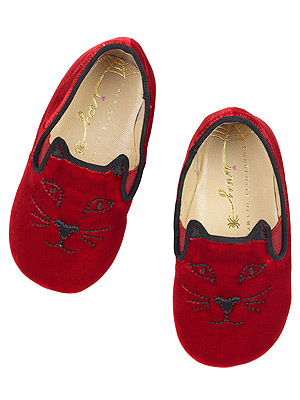 ), Charlotte Olympia slipped in six playful (and adorable!) designs for girls. Aptly timed to designer Charlotte Dellal‘s third pregnancy, the Incy line (get it? Incy, Wincy, Spider) features everything from velvet Kitty and Spider flats to leopard print booties that range from $125 to $395. So now fashion-obsessed moms can match their daughters or sons (seriously, how cute is this pic Dellal posted?) for every occasion. “I always thought I’d design little shoes for little people as soon as I had a girl,” Dellal told Vogue UK. Okay, we admit, these pint-size shoes are pretty pricey. But the company is donating 10 percent of the first month’s sales to Art Start, a N.Y.C. that helps nurture at-risk youth through creative workshops. Plus, each pair comes with a coloring book and crayons. And they’re really, really pretty. Available now, you’ll find the collection exclusively online and at certain Charlotte Olympia boutiques. You are currently browsing the archives for the Deals & Gear – Shoes category.